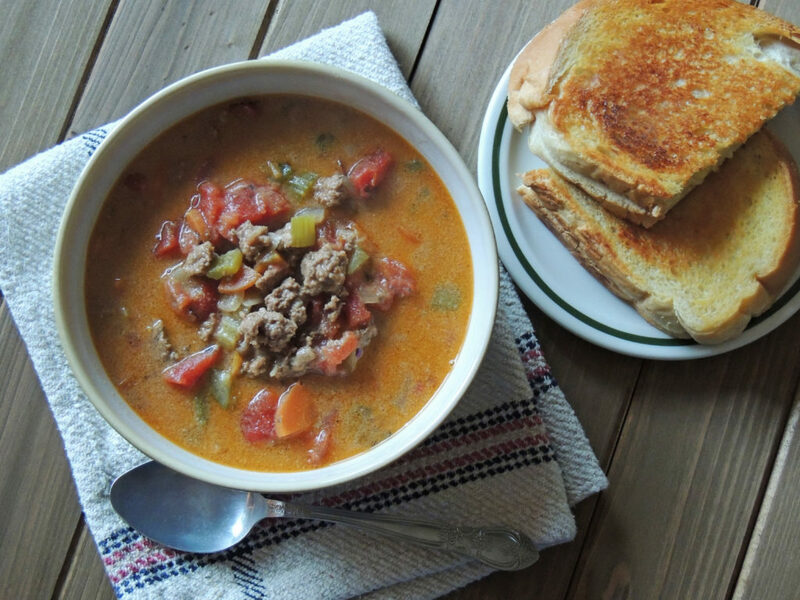 This is a brothier, lighter version of cheeseburger soup but with all the same great flavors we love. Brown the ground beef over medium heat in a large soup pot, breaking up the beef as it cooks. Season with salt while it’s cooking. When browned, remove beef to a bowl with a slotted spoon and set aside. Add the butter, onion, celery, carrot, and bay leaf. Season with salt. Saute the veggies until softened, about 8 minutes. Sprinkle the flour over the veggies and cook, stirring, for about 20 seconds. Add the beef broth, chopped pickle, pickle juice, and diced tomatoes with juice. Scrape the bottom of the pot to loosen any browned flour. Bring to a boil, reduce heat to low, and simmer 15 minutes. Add the beef back in and cook another 5 minutes. Remove the bay leaf and whisk in the sour cream. Add the cheese and stir until it’s melted. Season with salt and pepper. (Do not let it boil after adding the cheese.) Makes 4 good servings.